JUNIOR MINISTER FINIAN McGrath has attempted to play down recent events which have seen tensions strained in the Fine Gael-Independent Alliance government. Speaking today on Saturday with Claire Byrne, Disabilities Minister McGrath said that there was no crisis in government, following a tumultuous week last week. “There’s no crisis,” said McGrath. The junior minister was speaking after his colleague in the Independent Alliance John Halligan hit out at his government partners Fine Gael last week. The Minister of State for Skills and Training had threatened to leave the Fine Gael-led minority government if a second catheterisation lab, which specialises in examining the heart, wasn’t opened at University Hospital Waterford. A commitment to develop the lab was provided in the Programme for Government on the back of a positive independent review. However, the review found that a second lab was not needed, prompting Halligan to say that Fine Gael had “broken their promise on this”. I will bring all hell down on top of them if they don’t deliver this. A line seemed to be drawn under the incident this week, with Halligan appearing all smiles with Enda Kenny on Thursday. He also cancelled a scheduled appearance on the Late Late Show last night, amid speculation that he was being silenced. McGrath said today that Halligan was “very busy” all week and had chosen himself not to appear on the Late Late Show without prompt from his fellow Independents. “I know John was very busy all week doing his job as minister,” said McGrath. McGrath said that Halligan’s decision not to appear on the Late Late Show was “absolutely 100%” his own decision. “We were talking to John a number of times during the week… and we encouraged him to stay and stick with the Programme for Government,” he said. 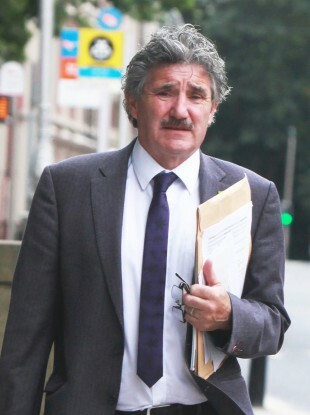 In relation to comments Halligan made about his Independent colleague – in which he called him an “idiot” – McGrath said that the junior minister had apologised. “There was a lot of sympathy and understanding for Boxer in relation to that particular comment that was made,” said McGrath. And in fairness to John he has actually apologised to Boxer Moran. Also speaking on the show, AAA-PBP TD Brid Smith said that Halligan was “very unhappy” in government. “Yesterday I spoke to him and he said ‘I’m very unhappy’,” she said. Smith said that it was difficult for Halligan – who is staunchly left-wing – to go into government with Fine Gael. “I think it’s a big mistake, I hope he does come out [of government],” said Smith. McGrath said that Halligan stayed in government the Independent Alliance said he would “back him 100%” in relation to services at Waterford general Hospital. “The Independent Alliance are committed to the Programme for Government, they’re committed to stability,” he said. Email ““There's no crisis" - Government plays down controversy as Halligan cancels Late Late Show appearance”. Feedback on ““There's no crisis" - Government plays down controversy as Halligan cancels Late Late Show appearance”.